In 2017 Oral-B launched the Pro 2 2000 and the Smart 4 4000, essentially replacing the models compared here. The primary difference between the new and older models is the battery. The newer models have a Lithium-Ion battery which doubles the battery life. The Smart 4 does have Bluetooth too.We wish to make you aware of the different models to ensure you make the right comparison and are getting the brush best suited to you and your needs. Here is our comparison table for the newer models, and we also include the original 2000 vs 4000 comparison below. The Pro 2000 is at the premium end of Oral-B’s ‘entry-level’ brushes, the Pro 4000 on the other hand is a more feature rich brush that commands a higher price. On the face of it sat side by side the brushes look very similar in design, so how how do they compare and which is the one to go for? We take a detailed look below in our Oral-B Pro 2000 vs 4000 comparison. These two brushes aren’t the easiest to compare because they sit at different stages of Oral-B’s range; the Pro 2000 is entry-level, whereas the Pro 4000 is mid-range. Our choice above, then, of the Pro 2000, is based on the fact that we ourselves would buy the Pro 2000, given it’s lower price point but sturdy performance. The Pro 4000 is available in only one colour compared to the 2 colour options of the Pro 2000. 2 cleaning modes are available on the Pro 2000 compared to the 4 on the Pro 4000. As the list of key differences indicates there are few differences between these two electric toothbrushes. Starting with the box contents, the Pro 4000 comes with 2 additional brush heads and a brush head container/storage unit. In addition to the CrosssAction brush head that comes with both brushes, the Pro 4000 comes with a 3D White and a Sensitive brush head which works in conjunction with the two additional cleaning modes found on the brush. We go over Oral-B brush heads in detail in our brush heads comparison post. The brush head container is designed to house up to 4 heads when not in use, of course 3 are provided in the box with the Pro 4000. An opaque lift up lid protects the brush heads when not in use and the compartment has been designed to incorporate the charging stand to the left to offer a neat all in one charging and storage unit for the Pro 4000. The Pro 2000 is available in a couple of colours the light/baby blue and white along with pink and white. Whilst the Pro 4000 is available in a royal blue and white only. It is the grippy rubber found on the front of the brush handle that actually differs in colour. Both brushes were first made available in June 2014 so have been on the market for a comparable amount of time. Both have a built in pressure sensor on the back of the brush. Behind the red/orange plastic is an LED that illuminates when too much pressure is being applied to the teeth when brushing. The LED goes out when the pressure is reduced. It is designed to act as a visual indicator to the increased pressure. You will likely too hear a difference in the sound coming from the brush as this does too change as the brush head speed reduces to limit damage. As both are identical in weight and size, the battery life is also the same with up to 28 minutes or 7 days of usage time when using the daily clean mode. However, the additional cleaning modes offered by the Pro 4000, that is the addition of sensitive and whitening can have a detrimental impact on the battery life. If you have more advanced oral hygiene needs the Pro 4000 is better suited to you than the Pro 2000. The same brush handle means they both feel equally as good in the hand. Whether you have small or large hands, good or limited movement in the fingers either brush is perfectly usable. The rubber on the front along with the plastic grips on the rear make the brush easy to hold when wet or dry and the power button located in the upper third of the brush handle is raised and offers good feedback when pressed. Both have a built in timer to assist with the 2 minute clean. The timer activates at 30, 60, 90 and 120 seconds briefly pausing the brush head motion to give an audible warning that it is time to change quadrant in the mouth. When we reviewed the Pro 2000 we gave it a rating of 4 and we gave the same to the Pro 4000 in our review. Our feeling is that the Pro 2000 brings better value for money, but if you need or want additional cleaning modes the Pro 4000 offers this. When reviewed the price of the Pro 2000 worked out at 7p per day based on 3 years of ownership compared to the 8p per day of the Pro 4000. This 3 year ownership ties in with the 3 year warranty available on these products too. 2 years is provided as standard, but an additional year is available by registering your brush online with Oral-B. At the time of writing the best prices for we could find for the Pro 2000 is £32.95 online whilst the Pro 4000 is £50.93. To find out more about either of these brushes why not click the relevant links below to be taken to the manufacturer’s website, to our hands on written reviews which include video or to one of our recommended outlets to purchase one at the best price possible. I found that from model pro 2000 to pro 9000 are all 48000 rpm. The difference are battery capacity, mode, accessories . That is true. Only 600 model has half of this speed (24000rpm). I remember this from ages ago when they were still giving info on the boxes. Now you cant even find the speed in tech specs in manuals. 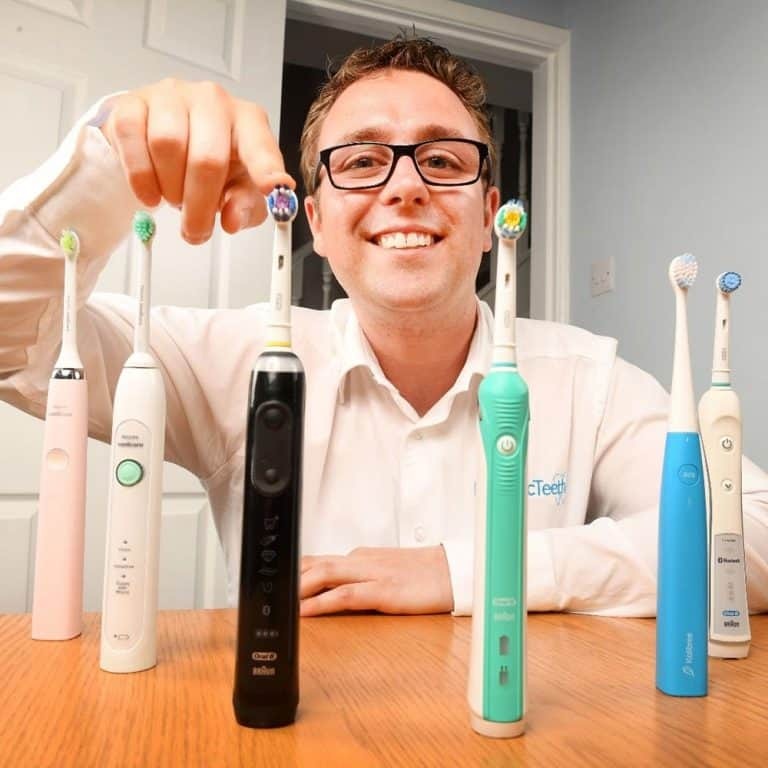 The vast array of electric toothbrushes is mind-boggling, and comparing them is just a nightmare! However, I hope I can help your readers to compare the Oral B / Braun ranges, from my own research in November 2016! 1. The fundamental and MOST IMPORTANT difference between the Pro 2000 and Pro 4000 series of brushes, is in fact that the Pro 4000 series is capable of giving a better (or faster or more effective) cleaning performance than the Pro 2000 series. 2. This is because the cleaning effectiveness is governed by the speed of the oscillations and pulsations of the brush, and this speed is much higher in the Pro 4000 series than in the Pro 2000 models. Just to note, the maximum cleaning effectiveness for each model is achieved in the “Daily Clean” mode. 3. As a point of interest, all models from the Pro 3000 series “upwards”, have a faster (more powerful) cleaning action in the “Daily Clean” mode, than the models from the Pro 2000 series “downwards”, which have a lower speed (less powerful) action on this setting. 4. The various additional modes on different price point models (for example, the sensitive mode etc) involve to some extent varying the speed. None of these modes have a more powerful cleaning action than the Daily Clean mode, but do offer other benefits to those users who want or need them. Of course, in the more expensive model ranges, there are also some “connectivity” options, which enable the user to connect their toothbrush to their smart phone or an electronic monitor. To confirm these points, or ask for any more detailed information, I would recommend contacting the manufacturer’s customer support dept. In my opinion, the 3000 series is probably the best value for money out of the Oral B ranges, if you simply want the most effective cleaning from an Oral B product. Sometimes, “higher” models can be found on offer at reduced prices, which of course is also attractive. If you want bells and whistles, then you can pay more for them, and if you are on a tighter budget, then of course the 2000 series and below should become a more attractive option. Thanks for replying with such a fantastic level of detail. It certainly sounds like you have done your research and I am convinced many will find this very helpful. With such investigations you must have opted for a brush. You mention the Pro 3000 is the best value in your opinion, did you opt for this model?